Parents may have the noblest of intentions and consider television and video programs to be a rich source of educational value for their children. But in truth, says one researcher, they're primarily using the video screen as a convenient and cheap babysitter. Sue Schlembach, a recent master’s degree graduate from the University of Cincinnati (UC) educational studies program, says her research found that, for the most part, young children are watching TV, videos and other screen media while parents are trying to take care of other tasks in the home. The research also found that, although parents believed screen media could be used as an important learning tool for their young children, parents may rarely use it for that purpose. The survey asked parents if they believed screen media could be an important educational tool and if they believed it was important to watch programs together with their child. It asked parents if they used screen time for instructional purposes, set rules or restrictions on screen use, or mainly used it as a monitoring or recreational activity. And finally, it asked how parents felt - positively or negatively - about their children's screen-media use. Schlembach says finding supported previous national studies that parents may be doing other tasks while young children are watching TV. Furthermore, over half said they left the TV on during meals and 48 percent indicated that often, the TV was on when no one was really watching. “This is a study that is certainly not meant to judge people, but rather to educate people about what’s going on at home,” Schlembach said. “For young children, meal time is a really important part of the day. It’s a time for parents to engage in conversation with their children, serve as role models for dining behavior and also build on language and social skills." 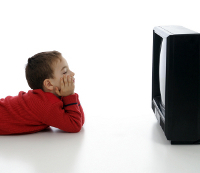 The American Academy of Pediatrics (AAP) recommendations that there should be no screen-media viewing at all for children under age 2, and that for older children, parents should engage in viewing and interacting with their children about the program material. Schlembach says she was interested in exploring parental attitudes about kids and screen time because she was interested in early childhood development and what role screen use plays in it. Ultimately, Schlembach hopes health care providers will talk with parents about screen media time as part of their health checklist, and as part of efforts to educate parents about child development AAP recommendations.